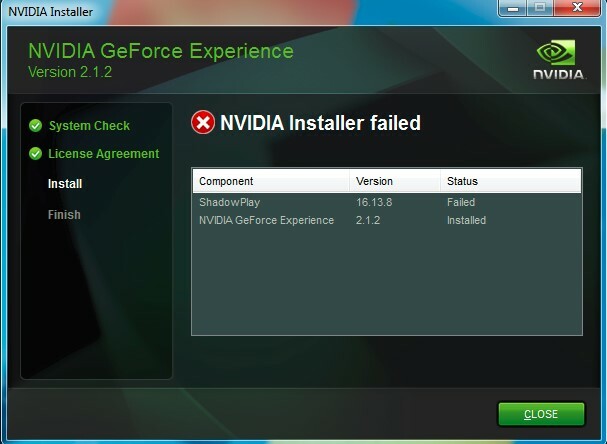 ShadowPlay install fails while installing or updating NVIDIA GeForce Experience. The ShadowPlay feature requires Microsoft DirectX. When installing ShadowPlay, NVIDIA GeForce Experience will also install any required DirectX files. However, if the system has corrupt DirectX files already installed it may casue an installation failure. You can manually install the Direct X files first. 1) You can download and install the DirectX Runtime from Microsoft’s web site. 2) Now run NVIDIA GeForce Experience setup again. If your installation is still failing, then most likely your DirectX files are either corrupt or the DirectX files are misplaced if you are using a 64 bit version of Windows. 3) Run the NVIDIA GeForce Experience setup again.